I would like to introduce you all to the wonderful owner of the Etsy shop Sapphire Island, Patty Andrea. She creates amazing minimalistic art inspired by the natural world around her. Lets get this interview started! 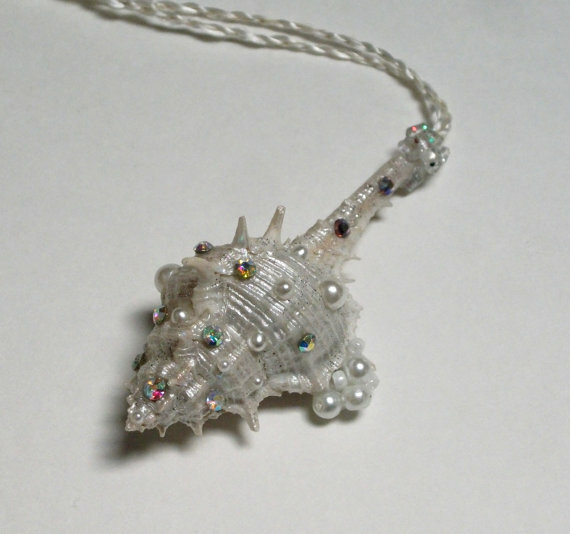 Patty: Most of the items in my Etsy shop are seashells I’ve found on beaches around the world. After the shells are cleaned up, I place them on large platters all over my studio and house, waiting for them to inspire the pattern/design that will work best for each shell. I usually paint part or all of the shells with a few coats of acrylic paint that I mix myself for just the right shade. Over a period of days (and sometimes weeks!) the design begins to reveal itself – I rarely just follow the simple path of plunking crystals and beads into the natural whorls and grooves of the pieces. 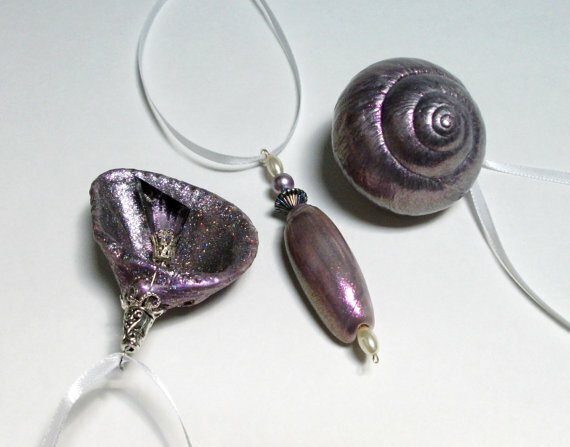 I prefer a more organic feel to most things which is why I LOVE working with oyster shells that are not often the “darlings” of seashell collectors or artists. I have a collection of antique jewelry that I have carted around with me for many years, to foreign countries, various U.S. states and storage facilities that I deconstruct and incorporate pieces of into some of my pieces. Shells are so wonderful in that nobody really knows where they have been as they drift around in the oceans, sustaining life for various creatures. Add a bit of old jewelry that has been shuffled around for a while from place to place and you have a lovely, mysterious little art piece! Patty: Most artists have a tough time of getting their work visible . . . I love that Etsy has made it possible to get my pieces out there for so many to see. I think there are a lot of people who would prefer to buy unique, one of a kind items, so this makes it easier for both the artist and the buyer. My least favorite part of Etsy would be photographing the items! I don’t mind writing the descriptions (most of my stuff has a story) but taking those pictures and making them really SHOW the piece in the best possible way, well, that has been a challenge for me. I will say, though, that you can find everything on the internet, so I have been learning photography and my photos are a lot better now than they were a few months ago when I first started! 1. Do what speaks to you . . . I have tried to do things that I think people will buy, but they always turn out mediocre because I don’t really have any passion for it. Monetary motivation doesn’t usually work for art – if you can’t “feel” it, you probably can’t do it! 2. You will get frustrated with bringing your ideas to fruition. But keep at it, and somehow, in a dream, sitting on a beach or reading a book, something will click and you will figure out how to achieve your vision. 3. Don’t throw anything away – some day a light may go off on how to re-work it! I know some artists who love a good trashing and feel a release by destroying something they’ve made because they think it’s crap, but I’ve found it’s better to relegate it to a dark closet for a while than to wreck it. I have heard many regrets from those who have fatally axed their works! 1. Figure out how to take good photos! Those pictures are going to be the biggest thing to draw someone into your shop. Etsy is very different from having your work in a gallery or boutique where lighting enhances the piece and people can pick them up, see your craft up close and feel the weight of it. 2. Don’t wait for everything to be perfect before you open your shop . . .jump in and do it! Certainly do your reading and research, figure out a strategy, but until you start, it’s hard to anticipate all the things you’ll come across that will need to be tweaked. You will make mistakes and not understand things, but there’s a wealth of information out there and sooner or later you’ll find the answers. 3. I am just learning how to use social media to gain views in my shop and I think it’s important to use it to your advantage. I am VERY new to it so I can’t offer much advice, but I am sure it is something all Etsy shops should be using – it’s free advertising! 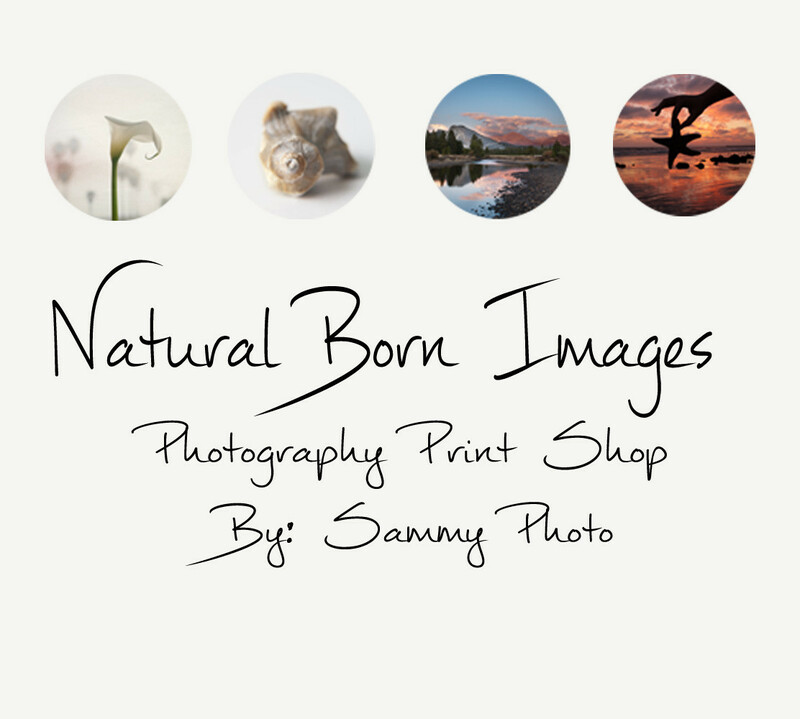 SammyPhoto: How did you get into creating art? Patty: I was always into interior design (as a kid, my bedroom was my “palette”; later, my husband and I bought and sold a number of homes) and found that if I wanted something that was “just right” for a particular spot, I had to make it myself. I’ve also been a bit of a hoarder of shells, rocks, beads and other bright, shiny objects so my collections just kind of led me into designs implementing what I had on hand. I have had some of my beads since the ’60’s (and still can’t quite part with some of them, but some day. . .) Through many trials and tribulations, I have discovered I am not a painter, I can’t draw and the idea of very large works scares me. But the thought of taking different things and putting them together to form something cohesive gives me great satisfaction. So, in lieu of doing what I REALLY wanted to do, I made a living the way most of us do, at jobs we don’t really like, fitting my creative time in when I could. Then, I decided to just chuck all that world behind me and figure out what would really make me happy. My husband and I got rid of most of our earthly possessions, moved to a remote beach along the Pacific at the edge of a Costa Rican jungle and started a fresh life of self-sufficiency (not to mention self-fulfillment!) It was the first time I had to create almost EVERYTHING out of nothing (instead of just creating SOME things out of nothing.) And though I had tons of shells back in the States in storage, Costa Rica was really where I found a need to create something out of them rather than just pile them in a bowl. Patty: I grew up in an enclave of summer-only beach homes on the shores of Lake Michigan (my dad had winterized our home in the 50’s). My sister and I had plenty of playmates during the summer when big-city kids would come to their summer cottages, but after Labor Day, when the summer kids went home, we were kind of on our own. Our school was almost a mile and a half away, which was pretty far when you are a little kid (the quickest route, still over a mile, was through a large, scary cemetery.) Michigan winters are gray, bone-chilling events and creative invention was a necessity . . . we did all kinds of things to keep busy and most of that we made up as we went along. Patty: Though I love uniformity and balance, my mind works best outside the box. Most of my pieces are abstract and whimsical, which feels more natural to me. I do have a bit of OCD with high regards for messiness. Chaos is not all bad! Patty: I do a lot of reading and writing, and still play my guitar once in a while. I like to participate in art shows a few times a year and have had some of my art in galleries and beach town boutiques. 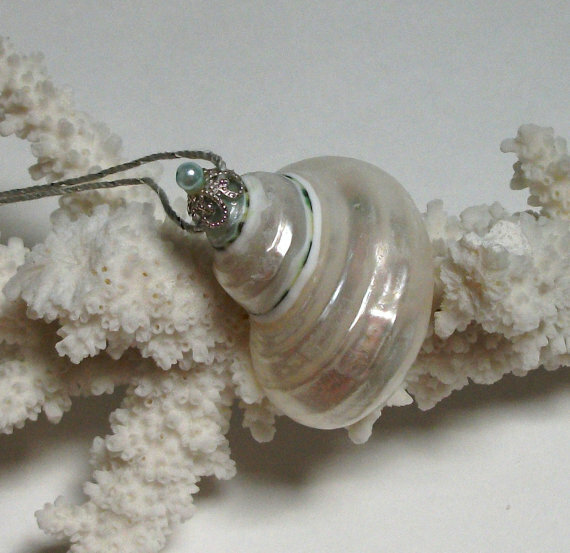 I am working on some small sculptures, incorporating natural finds with vintage jewelry and glass beads . 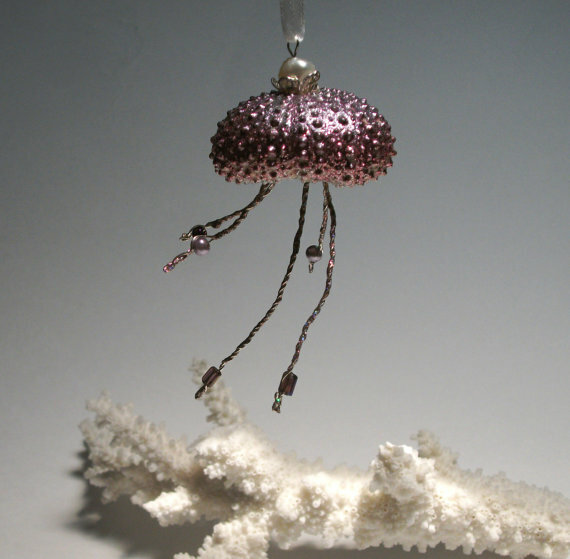 . . they are in the “dark closet” right now as I am working on ornaments for an upcoming Holiday show! I belong to an art league and volunteer my time to that when I can. Patty: Etsy doesn’t pay the bills yet, but I think I can make a nice little income out of it some day. I’m fairly new to the online world of selling, so I just have to keep working it. I do sell off line in shows and galleries. I like to do custom work for weddings, parties & holidays – some people just want what they want, in the colors they want it in. I have no problem with that. Patty: I taught myself in that if I needed something specific, I knew I would have to make it. I get a kick out of recycling things into useful (or just beautiful) objects. I think everyone has artistic abilities, they just need to figure out what they are. Patty: I love what I do and it never gets boring . . . there is always some new thing I want to try out. I feel pretty lucky to be able to do this now without having to work a “real” job to pay the bills, but that doesn’t mean I didn’t have to do it when I was younger! Great feature Sammy! Thanks for sharing! Glad you enjoyed it! Look out for featured artist interviews every friday.